Israeli military welds shut the home of Aamal Hashem Dundes. 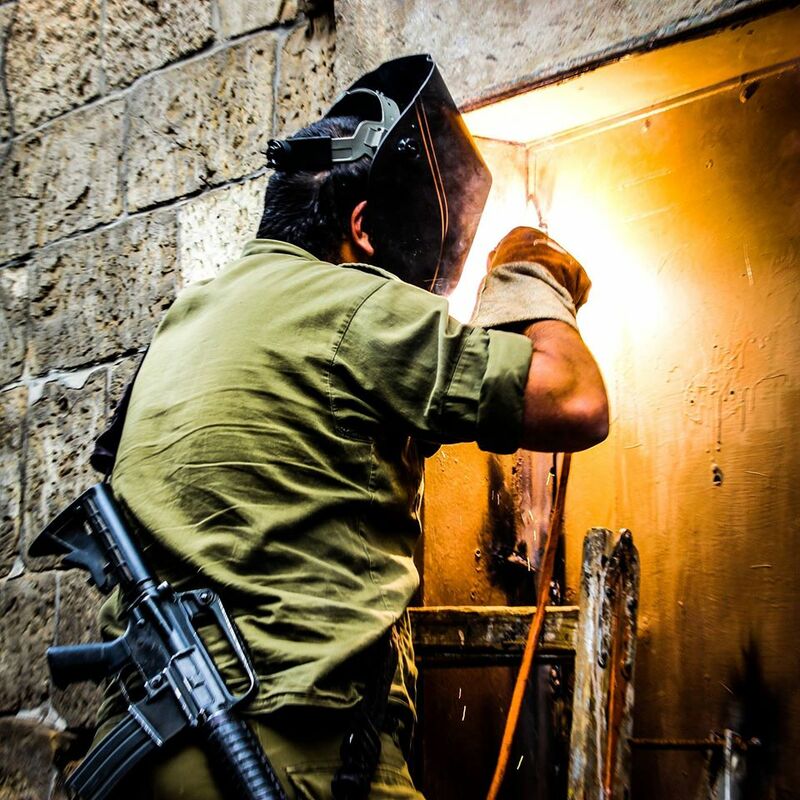 HEBRON, Palestine – On the morning of 19 January, Israeli forces welded Zuheira Hashem Dundes front doors shut. Her family have owned these two houses for centuries, and she still lived in one of them. Now, her belongings are sealed inside her house, and she must live in her son’s house across the street. The houses are located on Shuhada Street, most of which is closed to Palestinians. 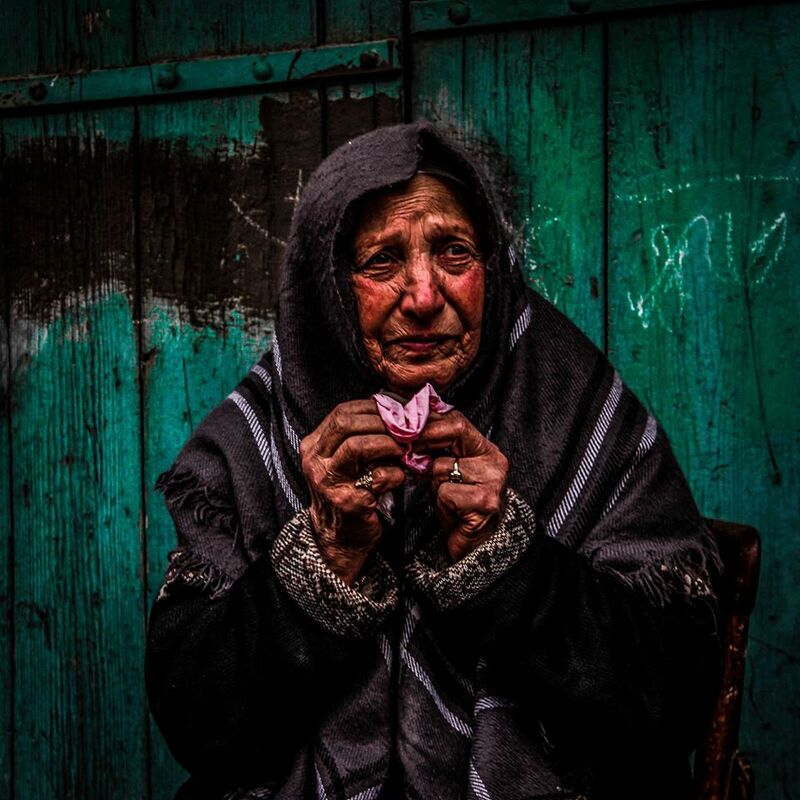 These women are some of the only Palestinians still living on Shuhada Street, making this act even more significant. 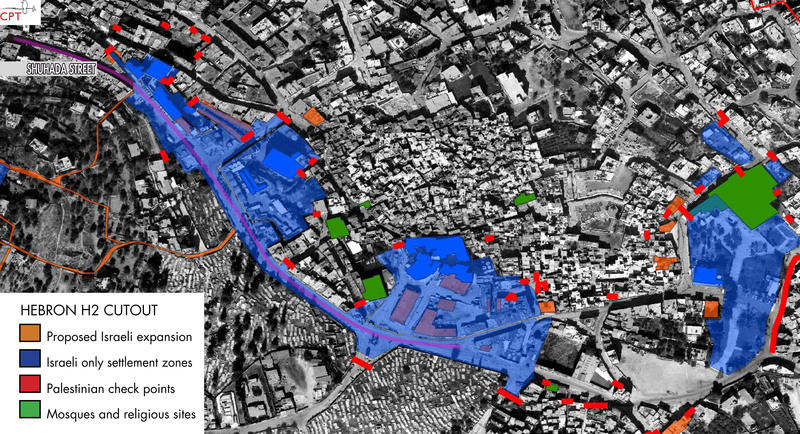 Shuhada Street and nearby settlements and checkpoints. Christian Peacemaker Teams received a call about the house closing and arrived at 11:30am. About one dozen IDF soldiers had surrounded the houses and were arguing with the two women. Several Israeli settlers were also present. The women continued to argue with the soldiers, and some concerned Palestinian citizens also advocated for the women to be able to keep their houses. 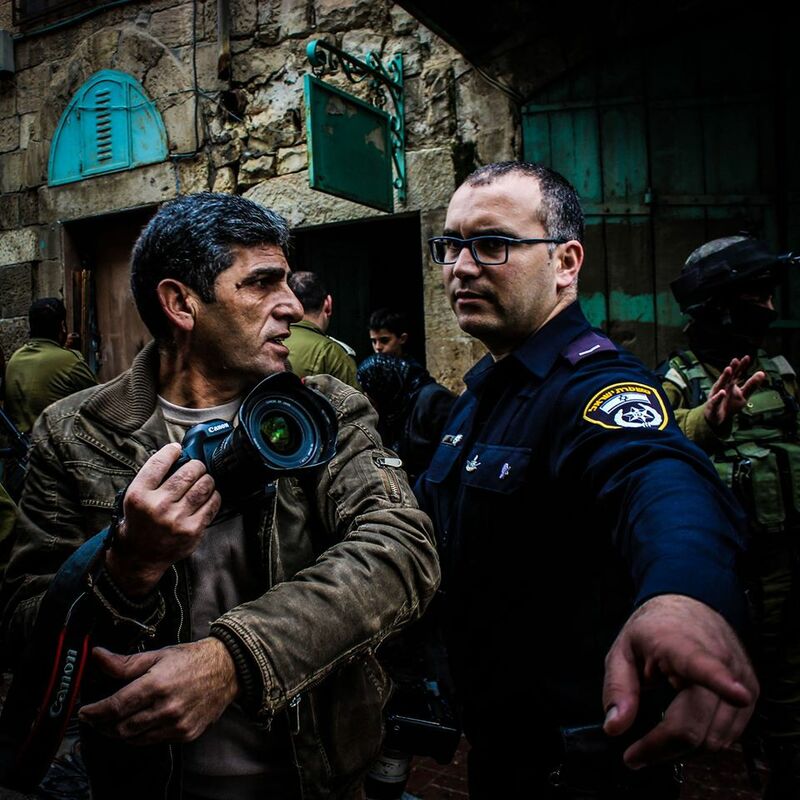 Israeli police prevent Palestinians from photographing the scene. As journalists and local Palestinians gathered, soldiers began pushing the crowd back across the street and away from the houses. At one point, a soldier violently shoved a member of CPT who was taking photographs. At 12:20pm, Zuheira was so distraught that an onlooker brought her a glass of water and a chair, and she sat by her front doors until soldiers forced her to move. By 12:30pm around fifty people had gathered, including representatives from several local and international human rights organizations. Soldiers pushed Palestinians and internationals back, but allowed settlers to stand close and antagonize the crowd. Zuheira has high blood pressure and diabetes, and the trauma of having her family home taken away from her made her faint. At 1:10pm, an ambulance arrived to take her to the hospital. Zuheira asked that a Christian Peacemaker Teams member accompany her in the ambulance, but the IDF prevented the CPTer from joining Zuheira. By 1:30pm, the soldiers had finished welding the doors shut. Most of the crowd dispersed, and international human rights activists accompanied the ambulance at a distance. The official reason given by the IDF for closing these houses is that someone used them to throw two molotov cocktails at the nearby Beit Hadassah settlement. However, when CPTers questioned one of the police officers, he admitted that the old women were not responsible throwing molotov cocktails and that neither the police nor the IDF had not talked to Zuheriah about the incident before sealing off her home and her possessions. Because most of Shuhada Street is closed to Palestinians, the unjustified actions of the IDF are even more devastating. More of the street is now empty, which will make it easier for nearby settlements to expand into this area. According to the Fourth Geneva Convention Article 49 and several United Nations resolutions, all Israeli settlements in the Occupied Palestinian Territories are illegal. The welding shut of Zuheira’s houses is a part of the slow takeover of this part of Hebron through military and settlement expansion, creating a corridor of Israeli control which threatens to further strangle the old city of Hebron. I would like to post an article about this in a net-based forum here in Norway, and in that connection: may I make use of a couple of those illustrative (and fantastic!) photos. Who should be credited in that case – just CPT/Hebron? Kjetil – Yes! You can credit Christian Peacemaker Teams – Palestine. Thank you!